Kalguksoo is a Korea noodle made of flour. It is traditionally made from fresh pasta, rolled out flat, then folded into layers before being cut into thin pasta or noodles with a knife, thus the word “kal,” which means knife in Korean. Today, my family stayed indoors from the snow storm, with the temperature being the lowest in 20 years, as low as 5°F, -15°C! 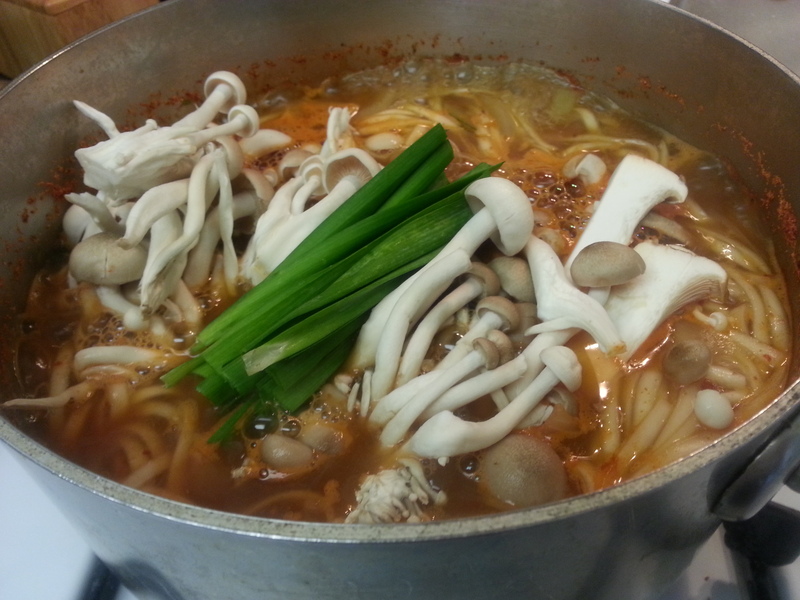 So I decided to make a belly warming, satisfying spicy noodle soup made with mushrooms. This simple dish took only about 30 minutes to make but was so delicious, I guarantee it will be one of your staple dishes. Use any mushrooms you like, as much as you want. Also, you can make this dish vegetarian if you use Bausut, Dashima Gukmul (버섯, 다시마국물): Mushroom, Dashima Broth instead of Myulchi Yuksoo (멸치육수): Dried Anchovy Broth as I did. While the broth is cooking, mix the marinade ingredients. 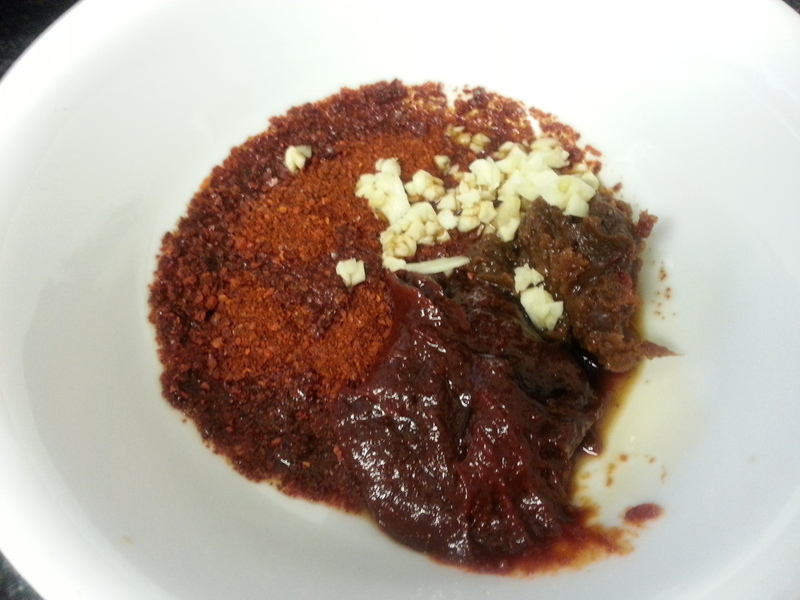 Mixing the marinade together helps the flavors combine as they sit together. 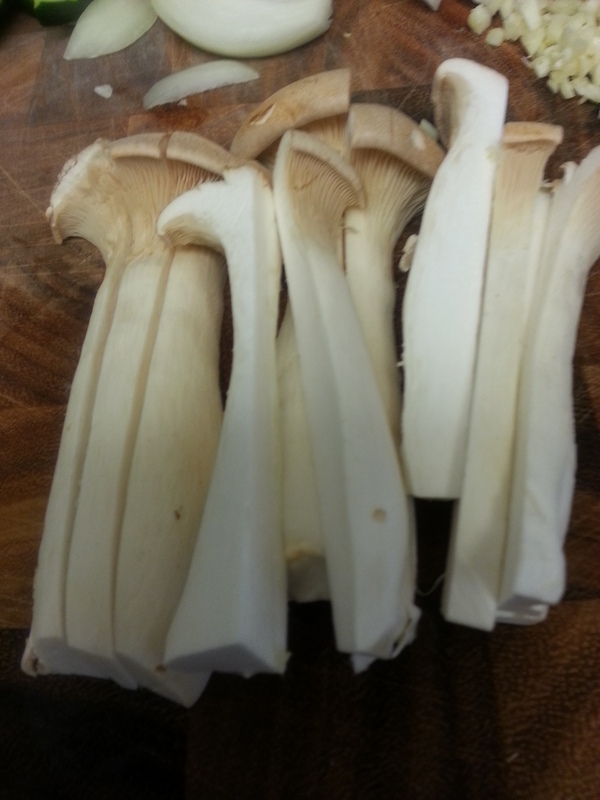 Prepare and cut the mushrooms and vegetables. 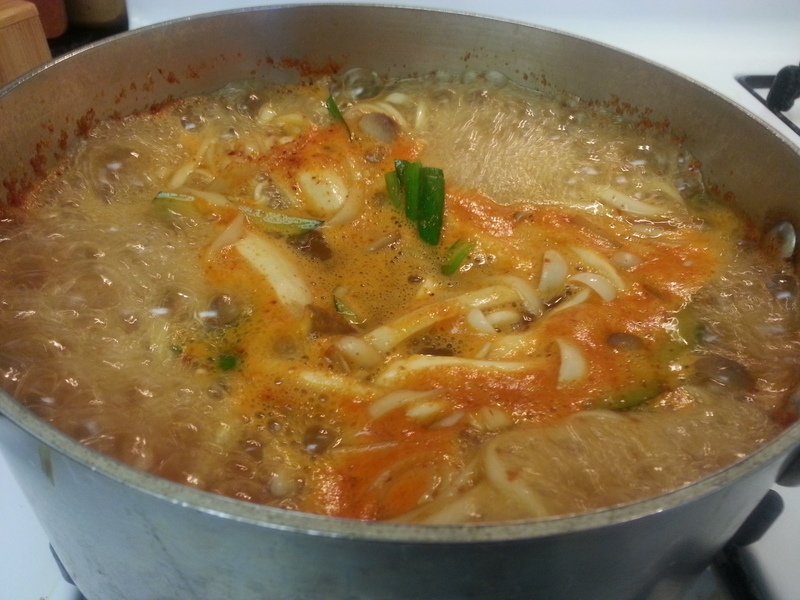 When the broth is done and comes to a boil, add the marinade but leave out about a tablespoon. You can always add it later if needed. 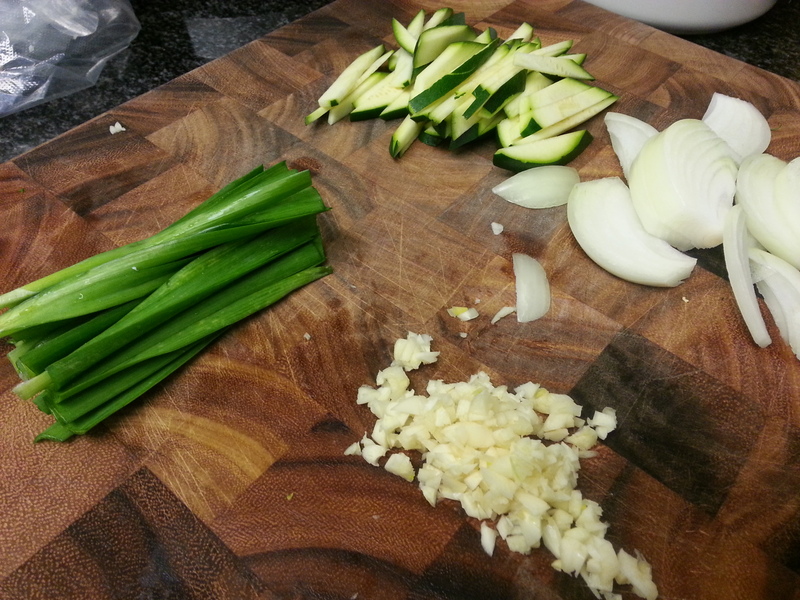 Add the onions and zucchini. Bring the soup to a boil. Add dried or fresh kalguksoo (칼국수, Korean flat noodles). I always keep the dried kind in the pantry, simply because it lasts a very long time and I don’t have to worry about it spoiling. Cook 2 minutes shy of the cooking instruction on the kalguksoo package. Note: For dried noodles, the rule of thumb for 1 serving is to hold the noodles vertically between your index finger and your thumb. 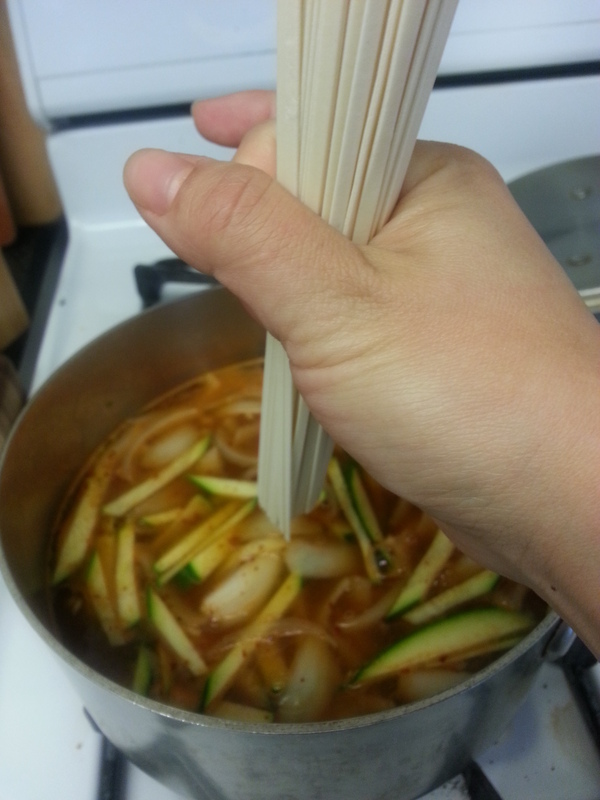 Measure the diameter of the noodles equal to about a medium sized coin (like a quarter cent in US or a 100 Korean won). Add the mushrooms, scallion or chives and chili peppers. I used a package of organic mixed mushrooms. 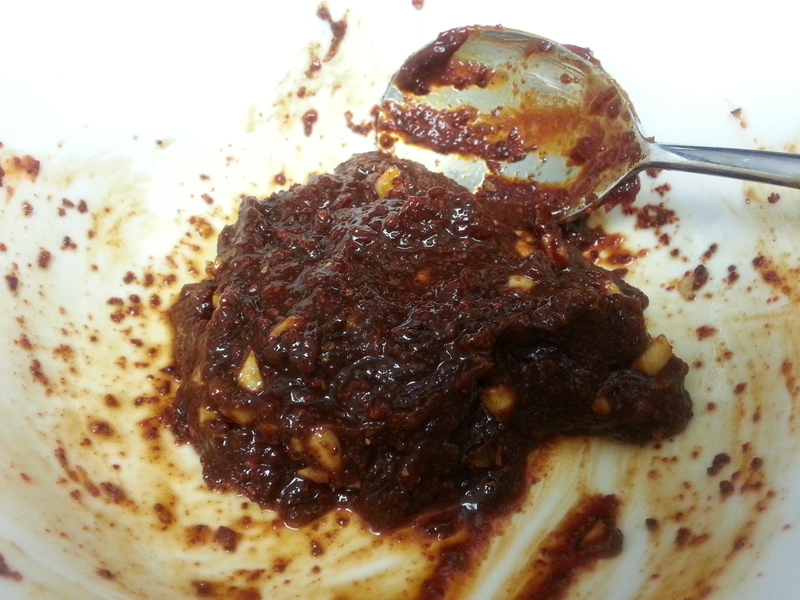 Taste and add the remaining marinade if needed. Cook for about another minute. 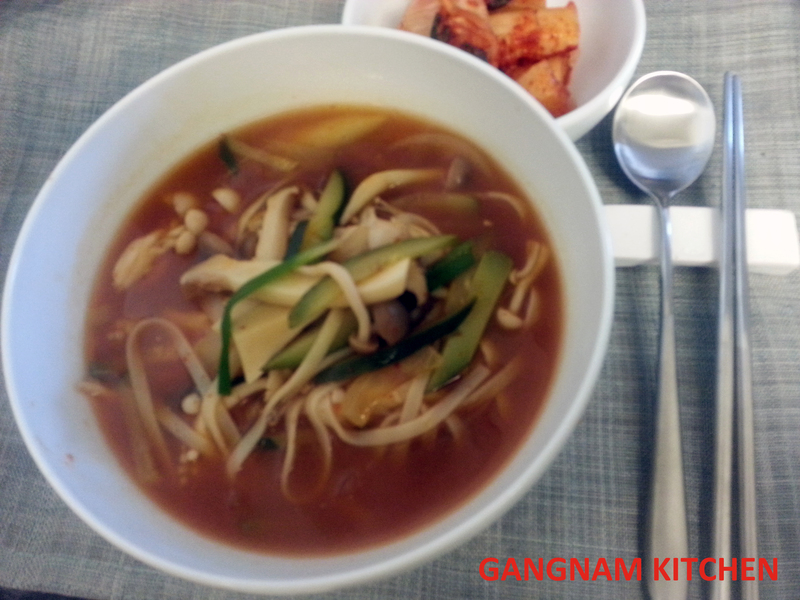 This entry was posted in Good for dinner, Good for lunch, Main Dish, Noodle Dish, Vegan/Vegetarian Options and tagged 칼국수, Kalguksoo, mushrooms, Noodle, Soup, Vegan/Vegetarian Options by gangnamkitchen. Bookmark the permalink.